We’ve begun conducting an annual study to measure online video viewing habits, as well as answer some nagging questions that relate more to current online video consumers than past consumers. This study was fairly complex and includes a lot of data, to make it more manageable we’re breaking down the results into 3 different parts. 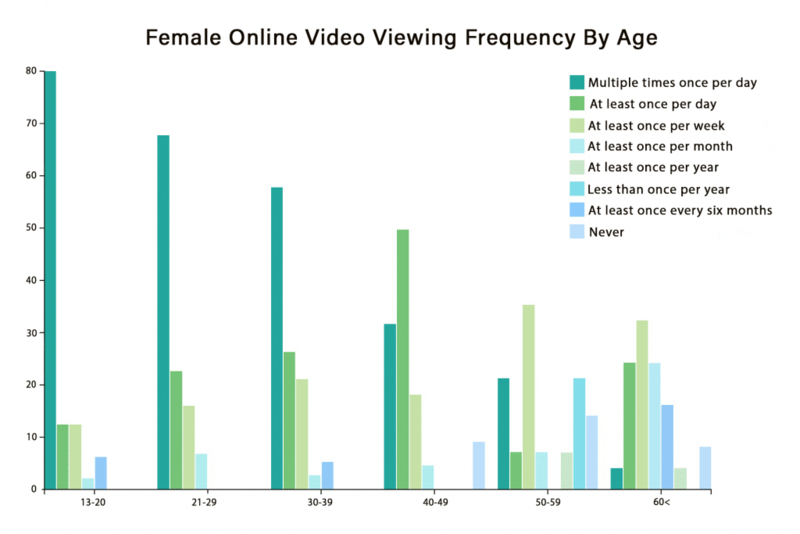 This first part will cover some basic data on viewing habits such as frequency and device usage. 53.59% of Americans said they view online videos multiple times per day and 19.23% of Americans said they viewed online video content at least once per day, meaning nearly 73% (72.82%) of Americans watch video content on the internet once per day or more frequently. 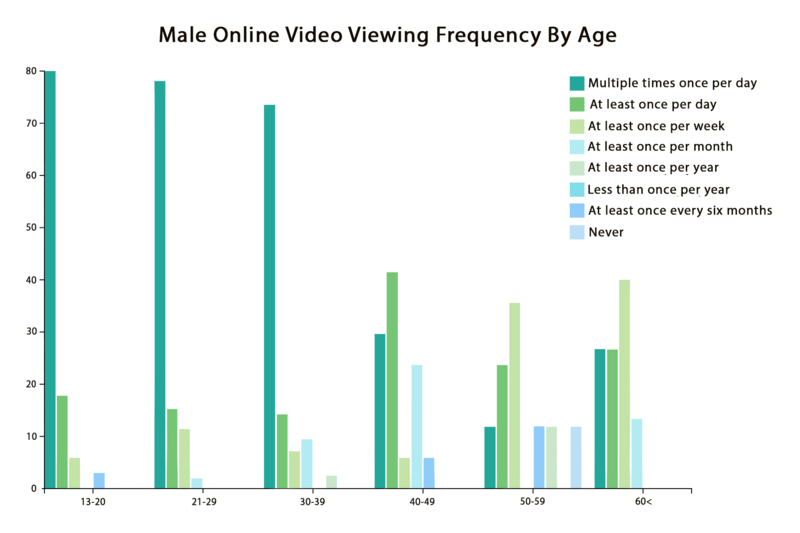 Younger Americans view online video at a higher frequency than older Americans with 72.53% of teens and young adults saying they watch video online multiple times per day. 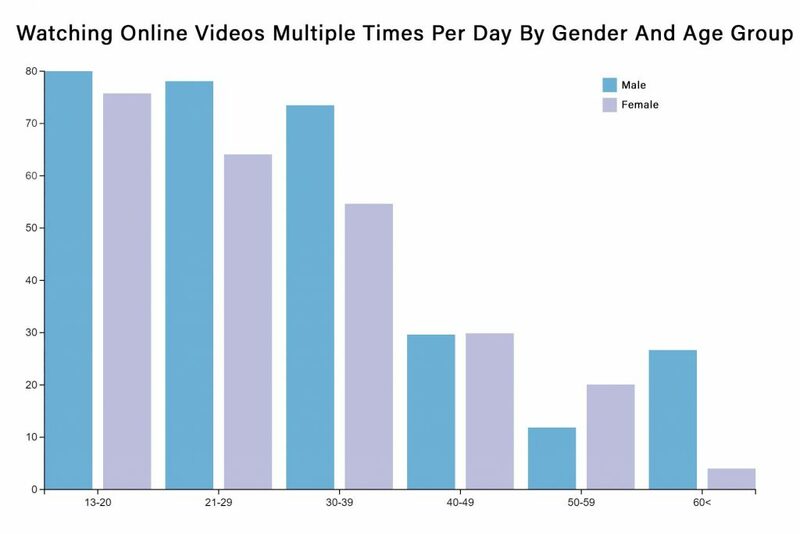 66.98% of adults in their 20’s (age 21-29) said they watch multiple videos daily, and 60.23% of adults in their 30’s said they watched videos multiple times per day. Adults over 40 watch videos online much more rarely than younger Adults and teenagers. 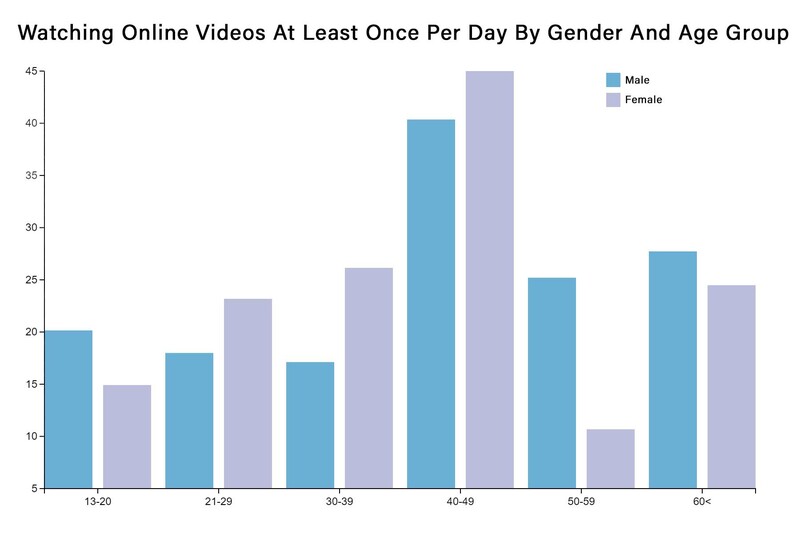 27.91% of adults in their 40’s (40-49) said they watch videos online multiple times per day but 41.86% of these same adults said they watched videos online ‘at least once per day’, as significant shift among adults. 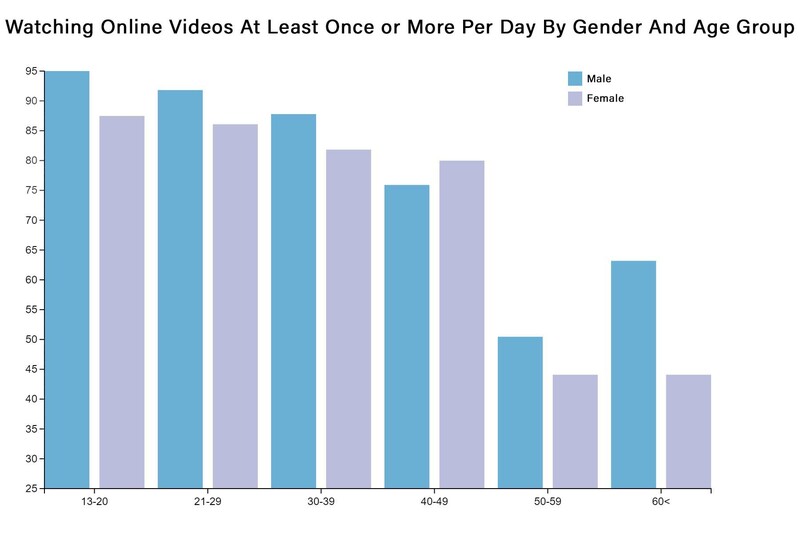 Only 16% of adults in their 50’s (50-59) watch online videos multiple times per day and only 12% say they watch online video at least once per day. This age group is more likely to watch online videos at least once per week with 32% selecting this response. The oldest age group of Americans we measured were 60 years and older. This group, commonly known as “seniors”, is incredibly unlikely to watch videos online with any frequency with only 8.11% saying they watched online video content multiple times per day and 21.62% saying they watch videos at least once per day. 5.41% of this population say they have never watched online video content. When asked what type of device they used to watch the majority of their online videos, the overwhelming majority responded telling us a smartphone was the main device type they used with 60% of responses giving us this answer. Laptop and Desktop computers came in a distance second at 27.18% and tablets were seldom used as the main video viewing device at only 12.82%. This data makes it very clear that if the future of the web is video, then that future is being viewed on smartphones far more than other devices. There’s been a lot of buzz about live streaming and we wanted to know how video watchers felt about it versus the on-demand video that helped spur the online video viewing era we have today. Only 17.44% of responders told us they preferred Live Streaming video over on-demand. 27.95% of responders told us they didn’t really have preference between the two types of online video content, and 54.62% said they preferred on-demand video content over live streaming. The most common reason consumers watch online videos is for entertainment purposes, 77.95% of our respondents said they watch online videos for entertainment. 45.13% of respondents said they watched online videos in order to learn something new (for a hobby or their own education), and 22.31% said they watched videos to learn something for work. A total of 51.79% of respondents selected one of the ‘to learn something new’ options making learning the second most popular reason why Americans view online video content. We wanted to know what features online video platforms aren’t giving to users that users want. According to our respondents the most wanted feature had something to do with ads. 33.85% of respondners to the survey told us they would like to see something new on video platforms that had to do with ads. Those requests ranged from the most popular and basic “No more ads” to a variety a little more defined “stop mid-roll ads” to a few more unique options such as “allow us to watch ads to build up credits to not see ads for a period of time”. 35.12% of respondents didn’t have any ideas for new features and were fine with all the current features in their video streaming platforms. It’s clear that most online video viewers either don’t like ads or don’t have ideas for new video platform features. When are auto-playing videos acceptable online? Respondents seemed split about when and why it was ok for an online video platform to auto-play videos. Only a minority of those who answered our survey thought it was never acceptable for a website or app to auto-play videos (i.e. they wanted to click or tap a play button) at 28.21%. 17.69% think videos in social media feeds like Facebook and Instagram are ok as long as they don’t have sound. Only 10.77% of respondents thought it was ok for “story” videos on Snapchat, Instagram, and Facebook to auto-play. That’s just a bit higher than the amount of people who are alright with auto-playing videos on news websites. Why do consumers leave comments on videos? Finally, in this portion of the study we wanted to better understand why online video viewers feel the need to engage with video content by leaving a comment. There are various positive reasons users can leave comments on videos, but there are also some more nefarious reasons, we’ll start with those. Our survey uncovered that 10% of Americans fully admit to leaving comments as a troll. Another 20.51% admitted to leaving spam comments such as promoting their own channel or website or announcing where they originally saw the video. 11.53% said they leave comments to complain about something. Now for the more wholesome reasons. 36.41% said they leave comments to show appreciation to the person or brand who posted the video. 28.46% said they leave comments on videos to tag or mention friends as a way of sharing the video. 27.69% leave comments to ask questions of the original poster. 12.05% told us they sometimes leave comments in hopes of making new friends. A majority of these respondents (59.57%) were between 18 and 29 years of age and were nearly dead-even split between men and women. There are also some comments that might be seen as wholesome or helpful but can also be construed on the web as rude, trolling, obnoxious, or unwanted. 24.10% of responders told us they sometimes leave comments to correct misinformation, 22.31% in order to try and educate others on the topic of the video, and 20.77% said they’ll leave comments to have a civil dialogue (which we know rarely happens). Note: The charts in this post were created with Microsoft’s new tool, Charticulator. If you’re looking for methodology of the study we’ll provide that at the end of the final part of this series and will link to it from here.